Are you worried that your child will have cavities in his/her teeth? Yes – every parent is always worried about cavities. Because all of us know how painful tooth cavities can be. And of course none of us want our children to have any pain if we can help it. So what are cavities? And what can we do to ensure that our children do not get cavities? 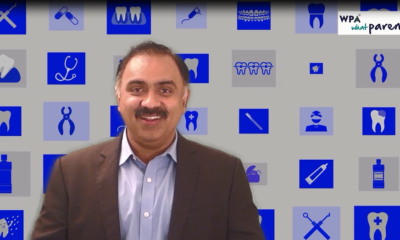 What are cavities in Teeth? A cavity in a tooth is basically a hole in a tooth. The hole is caused by decay or rotting of the tooth. When there is a cavity on the tooth – it shows up as a black spot on the tooth. This black spot which has a hole under it – must be treated immediately by a dentist. 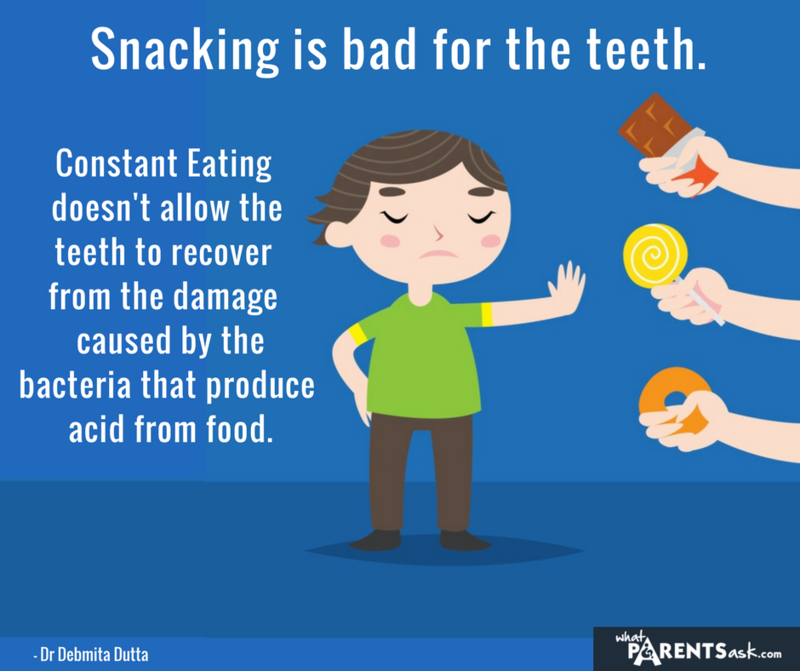 If cavities are not treated immediately – the food that your child eats can get stuck in that hole and make things even worse. The food that is stuck in the hole rots there and can cause bad breath, a lot of pain and can finally result in the tooth being completely eaten away by bacteria and your child finally losing a tooth. Which are the teeth that are most likely to have cavities in children? Teeth appear in the mouth – one or two at a time when babies are teething. And teeth can start having cavities from the moment they appear in the mouth. By the time all the teeth have appeared – a child has 28 teeth and all of these teeth can have cavities if we are not careful. Each tooth has many surfaces. Some of these surfaces are visible and easy to reach and clean – like the front or the top surface of the teeth. And some of the surfaces are difficult to reach – like the surfaces in between two teeth. Cavities can occur in any tooth and on any surface of any tooth – but usually the teeth that are used for chewing – that is the teeth in the back of the mouth which are called the molars are more likely to have cavities. Also in the molars the surface of the teeth that actually come in contact with food while chewing are more likely to decay. This is because these surfaces come into contact with food for longer. Cavities in between teeth, especially between the front teeth are more common in small children. The cause for cavities in the front teeth is bottle feeding. Especially bottle feeding at night. How do cavities develop in teeth? Our mouths are full of bacteria. There are millions of different bacteria and they live on our teeth, gums, tongue and other places in our mouths. We need these bacteria and some of them are essential for our good health. But some of these bacteria are harmful and can cause cavities. Cavities happen when some of these harmful bacteria use the sugar in the food that we eat to and produce acid. When a lot of acid is produced over a long time – the acid attacks the teeth and creates a hole in the tooth which is called a cavity. How will I know that my child is developing a tooth cavity? The first thing that can tell you that your child is developing a cavity in his teeth is the appearance of a white spot on a tooth. A white spot appears when enamel is lost from a certain area of the tooth. Enamel is the hard cover of the teeth and it protects the teeth from being attacked by bacteria. Enamel is constantly lost by the teeth every day and all the time – but usually the enamel that is lost is replaced by minerals that are present in saliva and fluoride. It is only when for some reason – either the holes in the enamel are being formed faster than they can be repaired – or when the minerals are not available in sufficient amounts to repair the holes – that cavities start developing. Children’s teeth are weaker than adult teeth and so once there is a white spot – it quickly progresses and becomes a cavity if something is not done about it immediately. 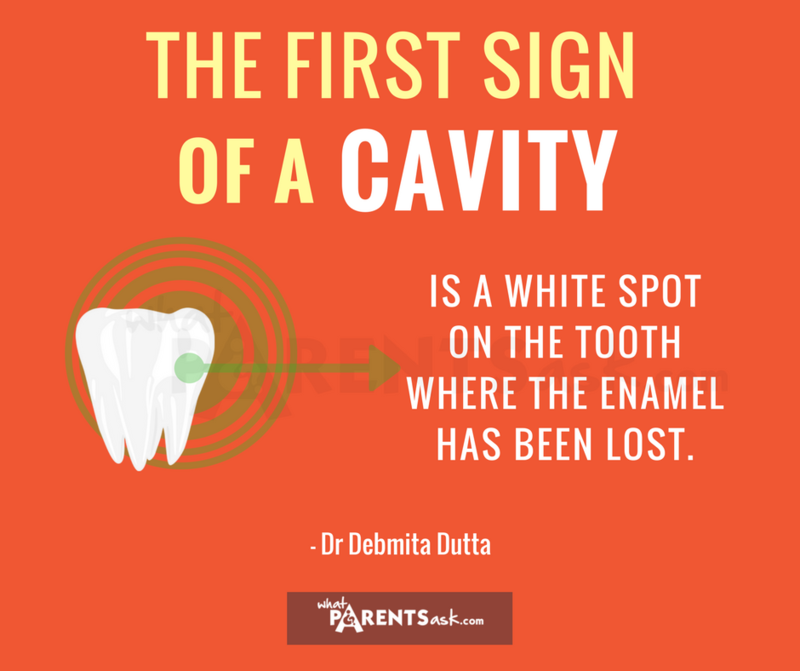 Once a cavity has formed – the white spot becomes black and keeps getting bigger. What causes tooth cavities in children? Enamel is the substance that covers each tooth and protects it from attack by bacteria. Enamel is one of the hardest things in the body and teeth are usually well protected. Cavities are formed when this enamel is damaged by acid which are produced by bacteria acting on the sugar present in the food that we eat. 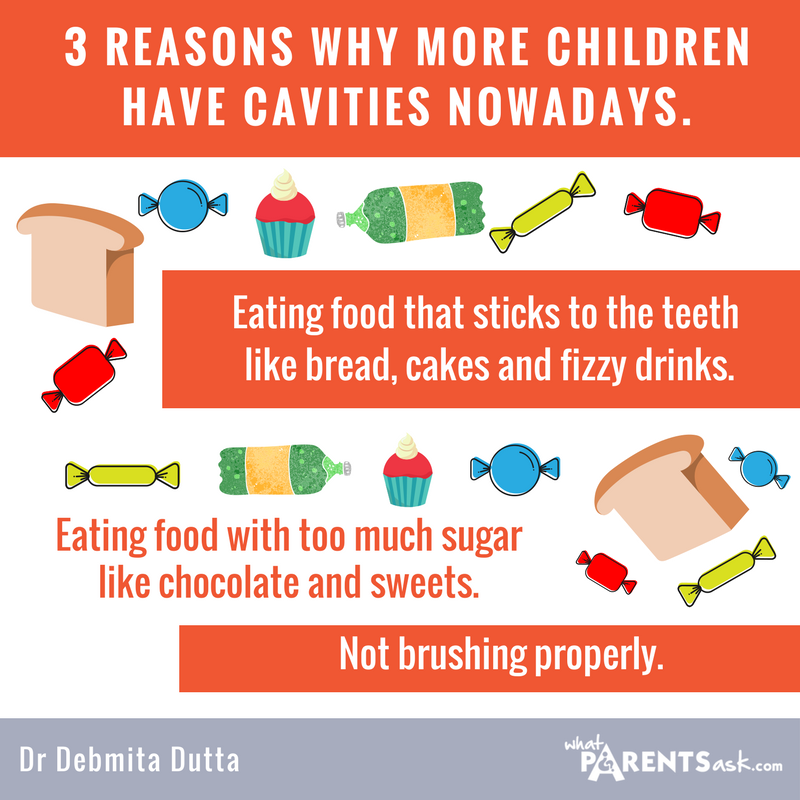 3 Reasons why more children have cavities nowadays. Children eat food that sticks to the teeth like bread and cakes In India – in the recent years – there has been a shift in focus towards eating packaged food that is low in fibre and high in sugar content. This is because Indian parents now have jobs that fill up the greater part of their days and when they come home there is very little time and energy left to cook. Children in India therefore have begun to prefer foods like breads cakes etc. since these are foods that they have been offered ever since they were very young and have become their comfort food. Food that is refined and low in fibre needs lesser chewing and results in the formation of a poorer bolus. Many food particles are then left out of the bolus and stay in the mouth even after the bolus has been swallowed. Because it is low in fibre content – junk food is also stickier and a lot of food particles remain stuck in the nooks and crevices on the tooth, gum and tongue surfaces after the food has been swallowed. First – the food stuck on the teeth is broken down into acid by the bacteria and this acid starts to dissolve the tooth forming cavities. Second – the food stuck on the gum attracts other bacteria that release toxins that can cause an infection of the gum called gingivitis. Third – the food stuck on the tongue is broken down by a third type of bacteria which release gases like sulphur and methyl mercaptan, which cause bad breath. Children eat food that has too much of sugar content. Snacking is the new norm in India nowadays. Food like cookies, bread, cake, candy soda and juice are eaten all the time by children as they play on their devices and watch television.Since these high sugar foods are ready to eat and available packaged they are easy to offer to children. 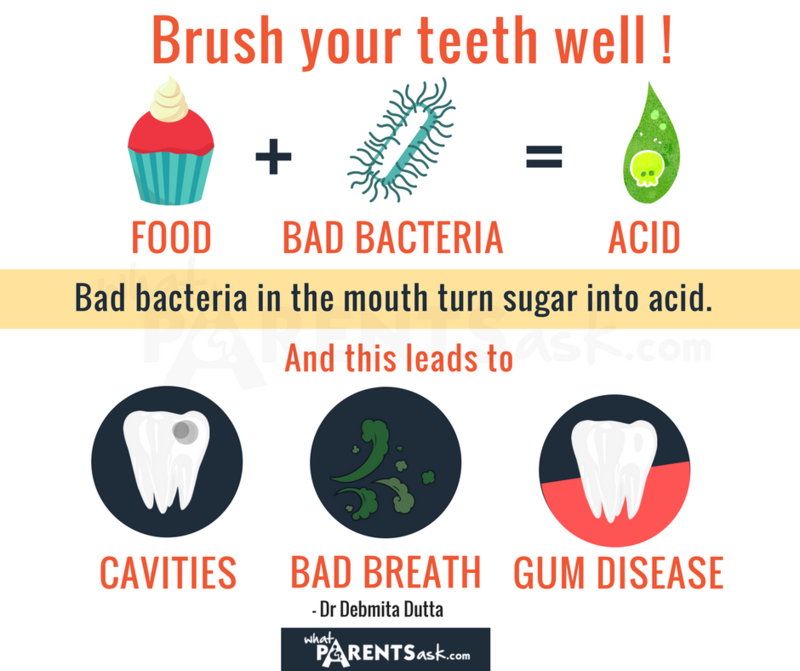 – they are eaten by children whenever they are nowadays and since these foods are full of sugar – children have a higher chance of developing cavities.Bacteria break down sugars to form acids that damage the teeth and cause cavities. 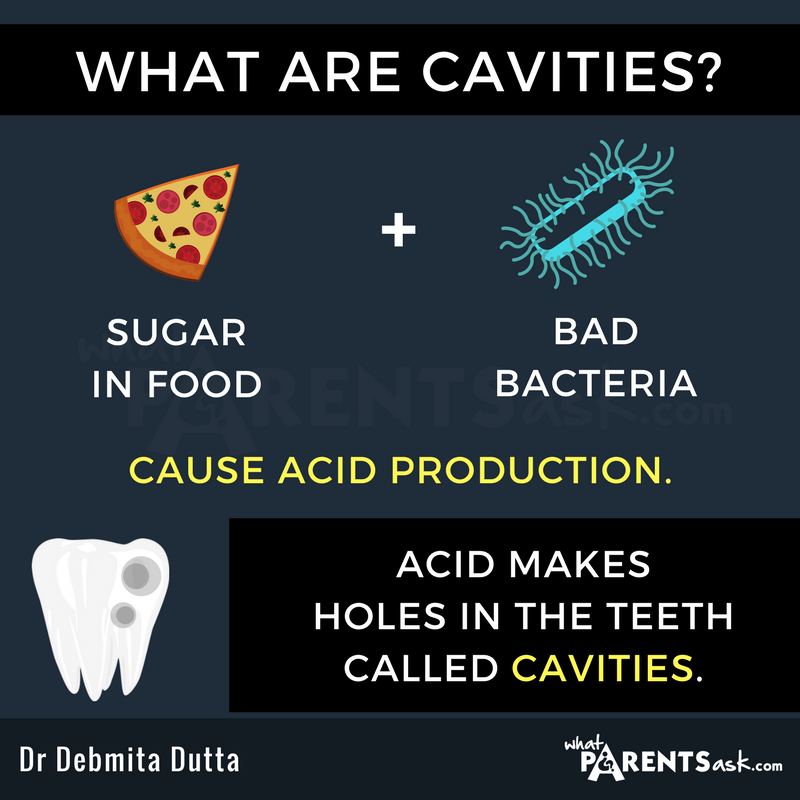 And the higher the amount of sugar or starch present in the food that is eaten – the larger the amount of acid produced and the greater the potential for the formation of cavities.Acid is constantly produced in the mouth and the damage done by this acid is constantly repaired by the minerals in saliva. But when food is eaten very frequently – like when a child is constantly snacking and eating some sugary food or the other all the time – there is no time to effectively repair this damage.Sugary foods are typically eaten as snacks – and they are eaten continuously and so they cause so much damage that it can’t be repaired by the minerals in saliva. Slowly the cavity becomes bigger and bigger and finally cannot be repaired by the body and must be repaired by a dentist who has to put in a filling. Children do not brush their teeth properly. There is a constant competition in the mouth between the bacteria that are trying to damage the teeth and form cavities – and the minerals in the mouth that are trying to repair this damage. When we brush – we periodically reduce the number of bad bacteria in the mouth. Because of the hectic lives that children live nowadays – they often do not brush properly. Long school hours, tons of extracurricular activities and the distraction of devices result in children not getting sufficient hours of sleep in the night. This results in them waking up late and rushing to get dressed in the morning. One of the commonest ways in which most children save time is by rushing through brushing their teeth. Poor brushing results in a buildup of bacteria in the mouth and causing tooth decay – finally resulting in cavities. When children brush badly – over a period of time – bacteria accumulate in such large numbers – that they start producing a sticky slime called plaque. Plaque later hardens to form tartar which is the yellowish layer that forms on teeth. Bacteria then hide in this hard layer – and it becomes very difficult to remove them. How to Prevent Tooth Decay & Cavities? It is most important to brush twice daily and brush correctly. Most parents ensure that their children brush their teeth in the morning. However, it is also important to ensure that children brush their teeth in the night before they go to bed. Why should children brush their teeth before sleeping? Brushing in the night before going to sleep is extremely important because during the night – the protective mechanisms of the mouth that work to keep the mouth bacteria free – do not function very well. One of the main ways in which the mouth cleans itself – is by producing saliva. Saliva washes away the bacteria in the mouth. It also neutralizes the acid in the mouth and minimizes the chances of cavity formation in the teeth. 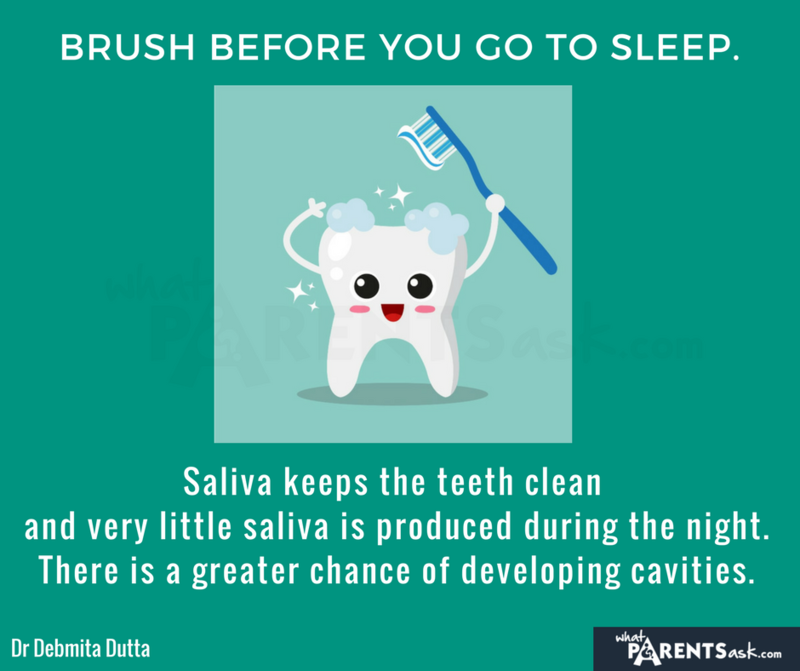 Very little saliva is produced in the night/when children are asleep. And therefore food particles that remain in the mouth after dinner stay there all night if children go to sleep without brushing their teeth. These food particles are attacked by bacteria and this results in cavities. Toothbrushes are available in super-soft, soft, medium and hard varieties. The soft or medium refers to the thickness of the bristles in the toothbrush. The thicker the bristle, the harder is the toothbrush. For children – a soft or medium brush is the best. How often must a new toothbrush be bought? Toothbrushes on an average need to be replaced every 3 months. When using the right pressure, the bristles tend to fray after 3 months. If your child’s toothbrush frays earlier, your child is either using too much force or is brushing in an abnormal direction. 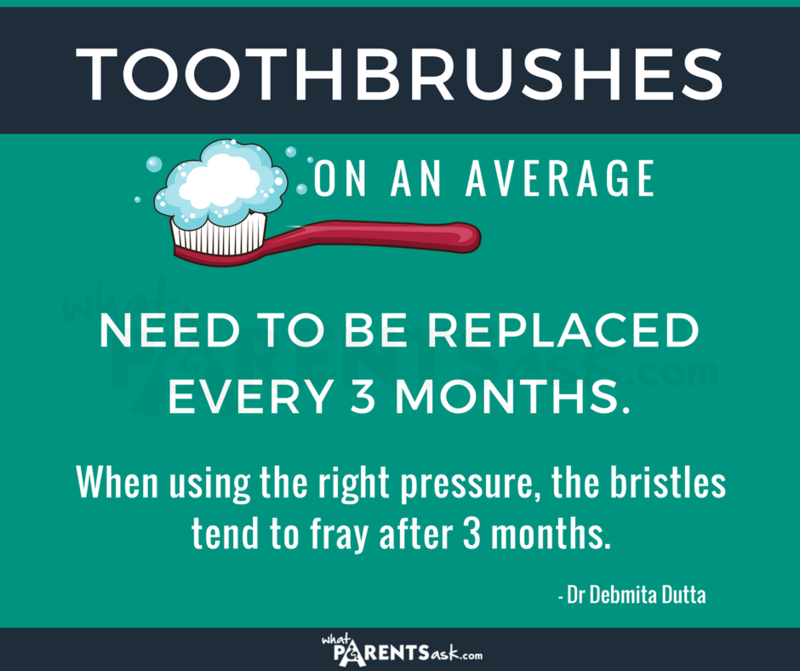 If your child’s toothbrush does not fray even after 3 months, maybe he is not using enough pressure. How should the teeth be brushed? In order to clean the teeth properly – the correct technique must be employed while brushing. 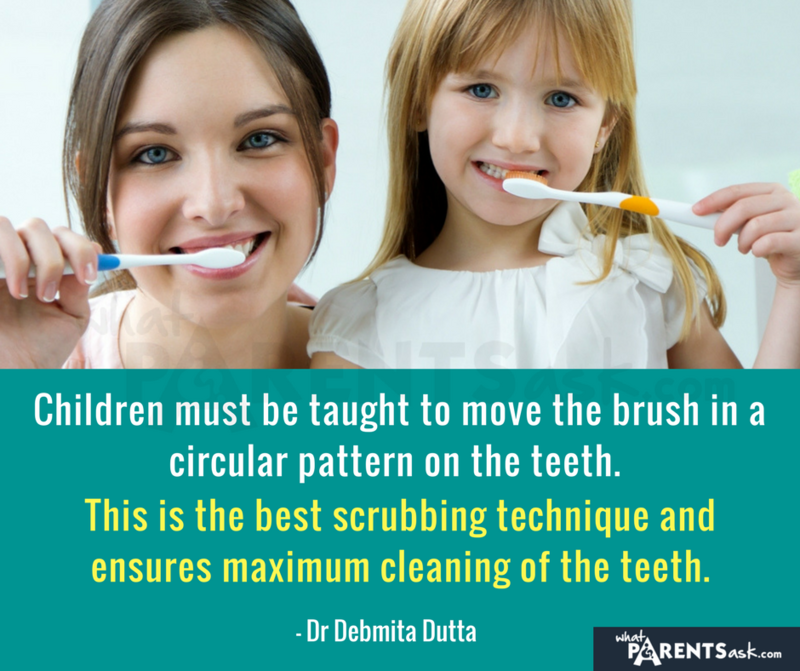 Children must be taught to move the brush in a circular pattern on the teeth. This is the best scrubbing technique and ensures maximum cleaning of the teeth. The vertical scrub is usually the best technique for adults and most adults employ this technique. Since children learn most of their habits by watching adults, unless they are specifically coached to brush with a circular motion – they are likely to leave their teeth unclean even after prolonged brushing with the best toothbrush. It is also important to repeatedly emphasize to children that each tooth has many surfaces and that they must turn and twist the brush such that it ends up cleaning all the surfaces of each tooth. On an average – to do a thorough job of brushing the teeth – a child must brush his teeth for at least 3 minutes in front of the mirror. Enamel is the hardest substance in the body. It covers the teeth and protects them from cavities. Enamel has an imperfect crystal structure and there are several gaps in its structure. When a toothpaste with fluoride is used – the fluoride fills these gaps and increases the strength of the enamel – making it resistant to decay, and the eventual formation of cavities. What should you look for when you buy your child’s toothpaste? The purpose of the toothpaste is to help the toothbrush remove the plaque and food particles effectively. The detergent present in the toothpaste is the main ingredient and it is the component that helps in the foaming action that helps in removing the bacteria and food particles from the mouth. Most toothpastes have sufficient detergent and you can buy any toothpaste that foams well for your child. Besides the detergent – children’s toothpastes must contain fluoride in the right quantity to prevent tooth decay and cavities. Other than these two ingredients – the detergent and the fluoride – the other advertised ingredients like fresh mint etc. Do not make too much difference to a child’s teeth. Whitening toothpastes and tooth pastes that prevent sensitivity also have very limited applicability for children. Is it important to use dental floss? Yes it is! 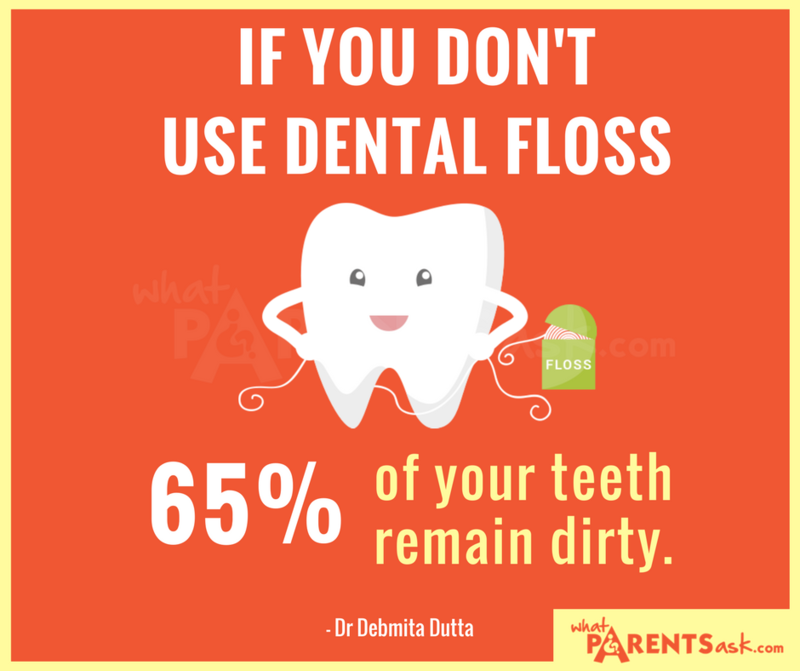 Because when you don’t use a dental floss more than 65% of the teeth surfaces are not cleaned. Using a floss helps keep the areas between the teeth clean and reduces risk of cavities. Parents in India are often unaware of the benefits of flossing – and most children are never taught how to floss correctly when they are little. This results in tooth decay. In India – parents take their children to the dentist only when they develop a toothache. The concept of preventive dental checkups are yet to catch on in India. However children usually benefit hugely from preventive dental checkups and it is a good practice to adopt. A preventive dental checkup involves cleaning and an examination. Dental sealants are one of the new techniques that can be used to prevent cavities in children’s teeth. Dental sealants are thin, plastic coatings that can be painted onto the chewing surfaces of the back teeth, or molars. Most of the cavities in children occur in the back teeth and on the chewing surfaces of the back teeth because they are rough and uneven and have small pits and grooves. These pits and grooves are difficult to clean because toothbrush bristles can’t easily reach there. And bacteria and food accumulate in these pit and grooves and cause cavities. Dental sealants can be used to cover these surfaces and form a barrier that protects teeth and prevents food and bacteria from getting trapped there. The first permanent molars come in between the ages of 5 and 7. These are called the 6 year molars. The second permanent molars come in when a child is between 11 and 14 years old. These are called the 12 year molars. It is important to visit the dentist when these molars appear. Calcium strengthens the teeth and prevents cavities. Do you have Calcium rich foods in your diet? Milk is the best source of Calcium and fortunately – in India most children are made to drink a glassful of milk in the morning and one glassful in the evening. Children who do not like to drink milk can be fed dairy products like curd, paneer , cheese etc.to ensure that they have a rich source of Calcium in their everyday food. Green leafy vegetables and almonds are also a great source of Calcium and they can be given to children who are lactose intolerant or allergic to milk products. Cheese is usually popular with children and eating cheese fortunately is also very good for the teeth. Eating cheese helps in neutralizing the acids produced in the mouth by bacteria, thereby reducing the risk of cavities. It is a good idea to encourage children to eat cheese in moderate amounts every day – to keep teeth healthy. Don’t allow constant grazing or snacking on junk food. Especially avoid food that sticks to the teeth. Visit the dentist every 6 months for a dental check up for your child.